To provide educational excellence in a Christ-centered environment. To be recognized for developing leaders prepared to impact our world for Christ through effective academic and educational practices based on a Biblical worldview. Biblically-based experiences that equip a student for a life-long, maturing relationship with Jesus Christ. A Biblical, accredited curriculum that prepares the student for the challenges of higher education and life-long learning. Athletic and educational programs that foster a Christ-like attitude towards competition and sportsmanship. 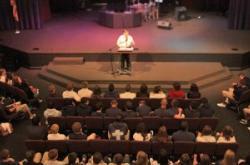 An academic community that models Christian character, conduct, accountability, and service. Capistrano Valley Christian Schools admits students of any racial or ethnic origin to all rights, privileges, programs, and activities generally accorded or made available to students at the school. The school does not discriminate on the basis of race, color, or ethnic origin in the administration of its educational policies, admissions policies, athletic or other school-administered programs.